On a bright, clear morning in the Munich suburb of Giesing, small groups of ultras in black jackets and blue and white scarves converge on the meeting point. But in the absence of Bundesliga derbies, the meetings between Bayern and 1860’s second teams in the fourth tier Regionalliga have taken on an increased importance. 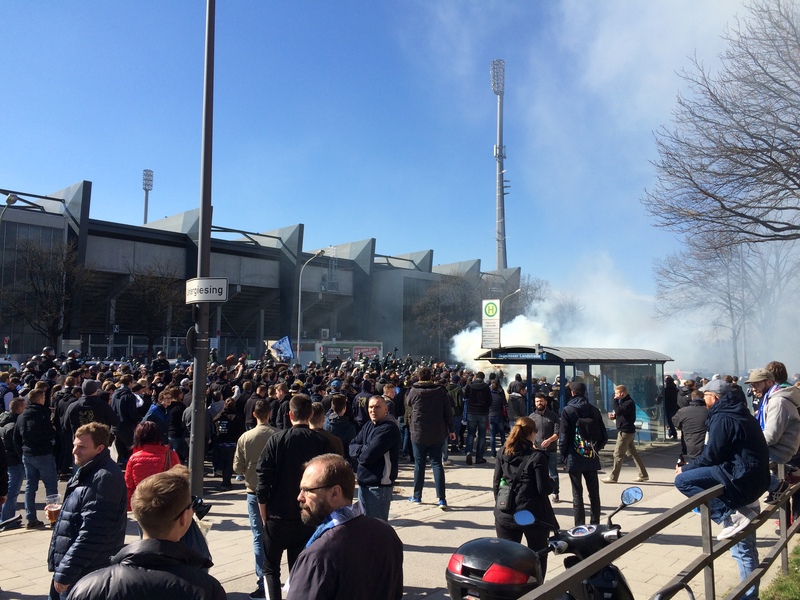 Between November 2013 and November 2015, up to 12,500 supporters attended the Amateurderbies at Munich’s old Stadion an der Grünwalder Straße, with tensions often boiling over between the two sets of fans. Inevitably, Bayern also attract substantial support from elsewhere in Germany – and all over Europe too – giving rise to the claim that Munich itself is blue. “Our regular away following has a Munich-based core obviously but it also includes fans from all over the place,” explains Tobi. “You see them at every game, no matter what, no matter where. That doesn’t matter. “Tickets can be difficult at times for the more glamorous games but if you’re in the right circles and know the right people, they get passed around. People look after each other. It only ever gets really tight against Dortmund or big European games. Today though, there are no tourists or half-and-half scarves to be seen as the two sets of fans reach the stadium simultaneously. “Death and hate to FCB!” chant the Sechzig supporters, adding a friendly: “Beat the reds to death, sha la la la la!” Blue and white smoke bombs are set off and eggs filled with blue powder are hurled towards the Bayern fans entering their turnstiles, but the presence of 400 police officers prevents any serious escalation. When the football gets underway, 1860 take an early lead but the atmosphere remains largely peaceful – a significant departure from previous meetings where flares have been thrown between the fan blocks and hooligans have attempted to break down fences. In the second half, the Bayern fans in the main stand unfurl a banner: “The Sheikh calls and his camels follow” – a provocative reference to their rivals’ new owner. In 2011, with 1860 Munich on the brink of bankruptcy, Jordanian billionaire Hasan Ismaik took over 60% of the club – albeit with only 49% voting rights in order to uphold German football’s 50+1% ownership rule. But Ismaik’s reign has been blighted by controversy from the very start and 1860 – German champions in 1966 – have become the basket case of German football. A total of 13 managers have been dismissed since the takeover while 1860 have dropped into the bottom half of Bundesliga 2. 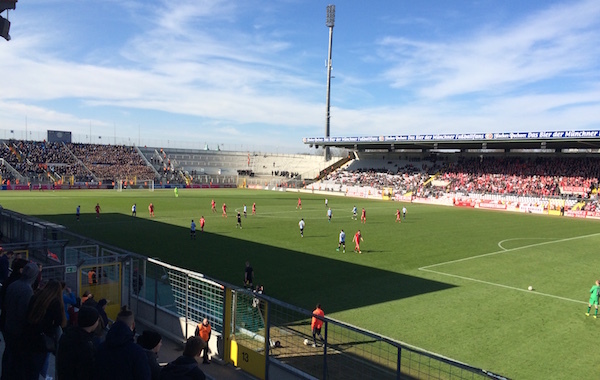 Only a last-minute winner in the relegation play-off against Holstein Kiel in 2015 prevented a drop into the third tier. This is the situation former Liverpool CEO Ian Ayre has arrived into following his appointment as 1860’s managing director in February. This season, the club have written even more negative headlines due to their relationship with the German media. Local newspapers Müncher Merkur, Tageszeitung and BILD München were stripped of their permanent accreditations whilst one journalist was refused entry to the club’s home game against FC St Pauli earlier this month after she reported on alleged bullying in the squad. At the same fixture, visiting St Pauli board members were asked to move from their seats after celebrating their team’s goals in the 2-1 win too exuberantly and too close to Ismaik. “When respect and freedom of expression are sacrificed at the altar of big money, good night football in Germany,” said St Pauli sporting director Andreas Rettig in a statement. Süddeutsche Zeitung has referred to Ismaik’s behaviour as “Trumpian” whilst kicker magazine has announced it will refuse to conduct any interviews with 1860 Munich players or staff. 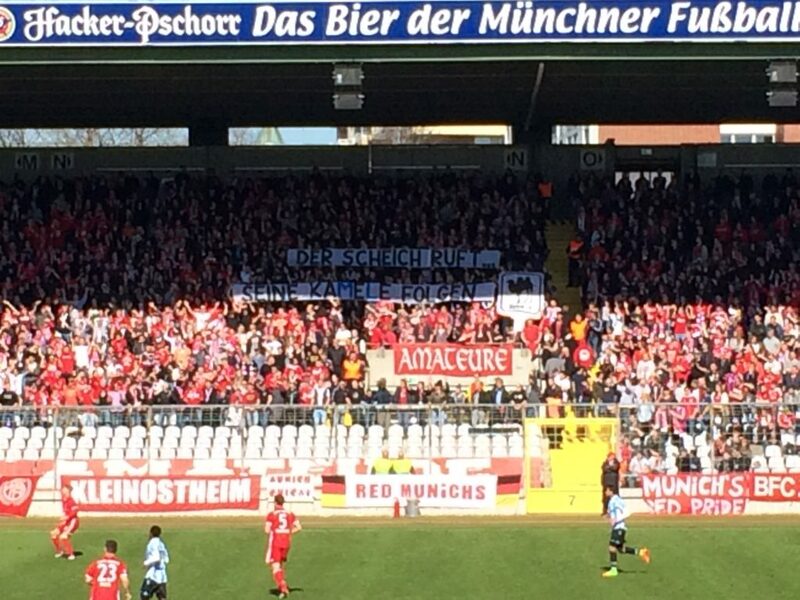 It’s not just fans and rival clubs who have a problem with the current regime at 1860 Munich. As the Lions wrap up a 2-0 victory in the second half and more smoke engulfs the away end, a watching Bundesliga scout explains that mismanagement at the club has had a negative effect on young players, too. The derby isn’t just important for the supporters; it’s a chance for Munich’s young players to put themselves in the shop window in front of a big, hostile crowd. “This is one of the most interesting arenas for Bundesliga clubs,” continues the scout. “Both of these clubs have outstanding records of producing high quality players. If 1860 have failed to make the most of their young players’ potential, city rivals Bayern are determined to take advantage. With an average age of over 27 and the retirement of captain Philipp Lahm and midfielder Xabi Alonso looming, Bayern’s first team squad is in need of fresh blood and club president Uli Hoeneß wants to plug the gaps internally. 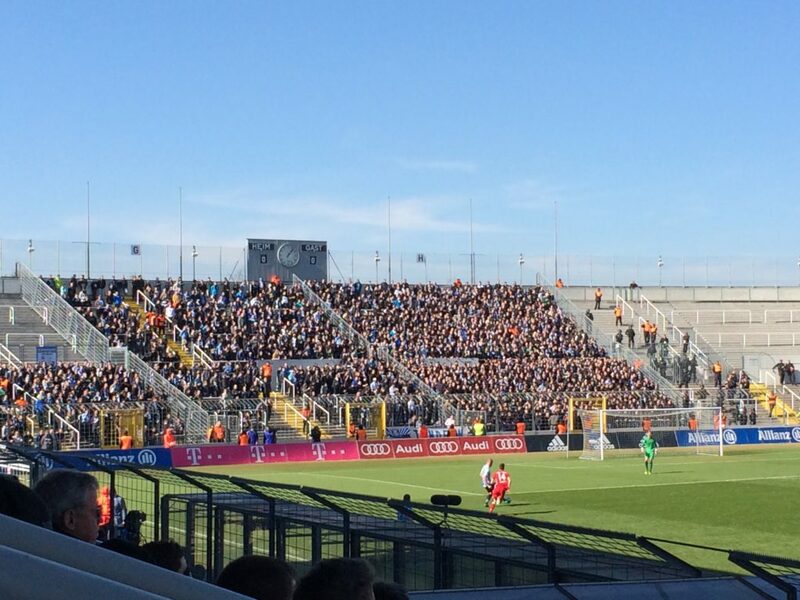 But, as the young 1860 Munich players celebrate their victory with the 2,500 fans behind the goal, a Munich derby in the Bundesliga seems further away than ever. For the time being, the question of red vs blue in Munich will continue to be an amateur affair.